alaTest a collecté et analysé 394 avis de consommateurs et d'experts pour le produit Coby Kyros MID7015. La note moyenne du produit est 3.2 sur 5, tandis que les autres produits de même catégorie ont une note moyenne de 4.3 sur 5. Les auteurs d'avis apprécient le rapport qualité/prix mais les testeurs ont des doutes sur le comfort d'utilisation. En moyenne, les consommateurs notent ce produit 63/100 et les experts notent ce produit 67/100. The very affordable Coby Kyros MID7015 Internet Touchscreen Tablet uses a limited version of Android, and lacks the grace and abilities of more advanced (and expensive) tablets. Affordable. Better-than-average graphics for Android 2.1. Supports 1080p playback via HDMI output. Comes with case and earbuds. AppsLib, the Archos-designed apps portal, is the only market available. Touch screen is resistive and not terribly sensitive. File sync is a tedious process. 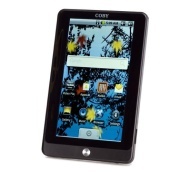 Coby's Kyros MID7015 is a slimmer successor of the MID7005 model, boasting the same 7-inch WVGA resistive touchscreen, Wi-Fi connectivity, Android 2.1 OS, web browser, SD card slot and Aldiko E-Book reader app. Kyros 7015 has meet expections and is well worth the money.